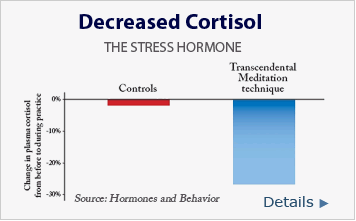 Post #17 – Is meditation an effective antidote to stress? 30 years ago when I co-founded A&T Systems, Inc., I would passionately talk to others in general conversations about the company and its future possibilities. Which, of course, I still do today. No surprise there. But one thing I found surprising were the comments I would get pretty frequently in response, such as: So how would you handle stress of running a business?, or you want to have a heart attack at young age? So, when one day in 1986, I saw a commercial on a local TV station, about Transcendental Meditation (TM) and how that was an indispensable tool for managing stress, I quickly signed up for an introductory meeting. At the meeting, the organizers served up lots of evidence on how TM helps manage and reduce stress. My wife, Kimberly, and I were both sold. We signed up right there. That weekend, we learned the TM technique and were told to do the meditation for 20 minutes twice a day. There were three follow up sessions on the following three days in which the teacher explained the theory behind the practice and answered the questions as they arose through the experience of actually doing the meditation. In these sessions, the teacher also did ‘checking’, a process whereby the teacher makes sure that we are practicing the meditation correctly. After these initial sessions, we went for checking after a couple of weeks, then couple of months and then once a year and then every few years. We immediately started to notice some changes in our lifestyle. Before learning TM, after work, I used to come home and grab a beer, turn on the TV and unwind. Now, I would come home, do TM and find that I no longer felt the need or desire for a beer. For Kimberly it was not as much beer in the evening, but a cup of coffee first thing in the morning to get going. After starting TM, she would wake up, do TM and then not feel the need or desire for a cup of coffee. She also noticed that the number of cups of coffee she used to drink in a day went down dramatically. Along the way, we learned that TM is one of the most researched meditation techniques. There are over 350 peer-reviewed research studies. Through this research, there is plenty evidence of the efficacy of the TM for managing stress and a host of other biomarkers for stress, many of those I discussed in the last post. The following are just a couple of examples from the TM website page, Proven effective for stress and anxiety. Recently, many celebrities have started to talk about and promote TM, e.g., Oprah, Seinfeld, Ellen Degeneres, some of them from their personal experience of having practiced TM for many years. But I am an experiential kind of guy, always asking the question, “But will it work for me?” From my personal experience, I can unequivocally say that it is an indispensable tool to be able to handle stress. There are days that I get home from work in the evening, when just looking at me Kimberly would says, “You look tired and hungry. Why don’t you eat something right away?” And, I would tell her that I need TM worse than I need food. I just do a 20 minute of TM and then I am refreshed and good to go until bed time. If anyone talks of being under stress all the time, they usually hear from me about the TM. I recommend TM without any reservations. Because of my proselytizing, In my immediate and extended family, everyone has learned TM – our sons, my brothers, my sister, and their children. I am not sure everyone does TM as regularly as I do, but they all have this tool that they can fall back upon. Our sons and nieces have mentioned of TM being very helpful in dealng with their college stress. I have been so impressed with the TM that I have actually gone and learned advanced methods, beyond the basic TM technique that I learned in 1985. I learned what is called Advanced Technique. I have also learned a process of TM that is called TM Sidhi, which requires much more commitment of time and money. TM Sidhi learning culminates into techniques for Yogic Flying, where you offer intention and your body lifts off from the ground. Of course, there are many other types of mediation. However, I have only incidental or superficial knowledge and experience of these, especially their role in stress management. I am not really able to talk about those with any authority or offer any guidance. Recently, I have been exposed to a type of meditation called Mindful Meditation. This type of meditation is being taken up in medical schools and universities such as UCLA, and is subject of research for stress reduction and management. What is your experience with meditation? 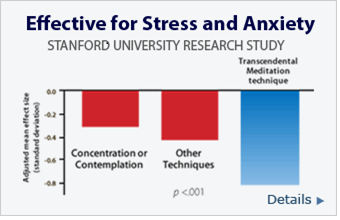 Have you found meditation useful method for managing stress?